2007- “Nia: Feral”- Life Performance at Reading University, UK –- DVD and life performance, with sound done by Nicola Zena Lumley and editing Kelly Lumley, camera Bono. 2007 – “Melting the ice” – performance – project in Haparanda, Sweden, with partners from Haparanda and “Step Beyond” mobility grant. 2006 – “Longing for love” – a project by Nia Pushkarova with oil paintings, photography and music, part of a project “Base Dating”, with partners “ Astro – prism” from Newcastle, UK, workshop by Nicola Lumley –digital music, Pro–Helvetia grant. 2002 – Solo-exhibition, London, UK, “Gallery Sophia”, oil paintings and photography. 2001- Exhibition- oil paintings at Sheraton Hotel, Sofia. 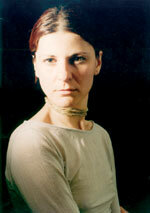 1999 – One woman show at the “XXL” Gallery, Sofia, Photographs and oil paintings. 1999 – VJ at The “Comix Club”, Varna. 1999 – 23 April – Vision, slide projection, photo-billboards (2x3m) and projection of computer generated images – Live video mix as part of the visual space concept for dj’s sets of dj Elbee Bad (USA), dj Valentine (BG), dj Chris (BG), dj No-Good (BG), and dj Jassen Petrov (BG), curator Nia Pushkarova in collaboration with Deyan Raikov and Elenko Elenkov – LL. 1998 – Vision (VJ) – slide projection at the concert of “Band of Mad Women”, Sofia. 1997 – participation at art-plainer Trojan, Life-Art performance. 1997 – Photo – exhibition at Jazz Club” St. George”, Sofia dedicated after Student protests February’97. 1995 – Degree show, Reading University, UK- video and photo installation. 1994 – Non-degree show at Reading University, UK, oil paintings. 1994 – “A Trace of Touch” – Arapya, international art symposium, coordinator from behalf of Bulgarian University Pedagogue team. 1994 – “Art in Reading” – installation with slides and paintings. 1988 – “10x10x10”, Exhibition organised by Art in Action, Sofia University.